Mónica Fernández-Aceytuno, one of the greatest promoters of Nature in our country, reviews in this practical and generalist book the geography of Spain and focuses on explaining in a simple way the diversity of the flora and fauna of each region. It is worth mentioning here that Spain is the European country with the greatest biodiversity. The book has drawings, simple explanations, a certain poetic air and it is, above all, entertaining and informative. 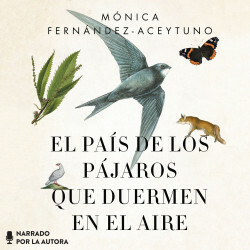 Mónica Fernández-Aceytuno (1961) Villa Cisneros (Spanish Sahara). She graduated in Biological Sciences from the Universidad Complutense de Madrid, and since 1991 she has been dedicated to the promotion of Nature in the press. She won the National Environmental Prize "Felix Rodríguez de la Fuente de Conservación de la Naturaleza" in 2003 and the Jaime de Foxá Literary Prize in 2007. The International Festival of Environmental Film of the Canary Islands (FICMEC) awarded her with the Brote Comunicación in 2016 "for her literary creations both literary and audiovisual, when transmitting the sensations that the natural landscape unpins under her contemplation".